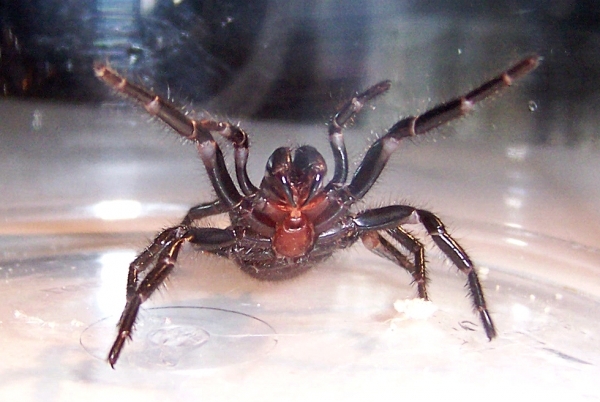 Description While the venoms of most species of The solution structure of robustoxin, the lethal neurotoxin from the Sydney funnel-web spider Atrax robustus, has been determined from 2D 1H NMR data. Robustoxin is a polypeptide of 42 residues cross-linked by four disulphide bonds, the connectivities of which were determined from NMR data and trial structure calculations to be 1-15, 8-20, 14-31 and 16-42 (a 1-4/2-6/3-7/5-8 pattern). The structure consists of a small three-stranded, anti-parallel beta-sheet and a series of interlocking gamma-turns at the C-terminus. It also contains a cystine knot, thus placing it in the inhibitor cystine knot motif family of structures, which includes the omega-conotoxins and a number of plant and animal toxins and protease inhibitors. Robustoxin contains three distinct charged patches on its surface, and an extended loop that includes several aromatic and non-polar residues. Both of these structural features may play a role in its binding to the voltage-gated sodium channel. Robustoxin is a unique presynaptic neurotoxin, lethal in man, other primates, and newborn mice, but non-lethal in many other laboratory animals (or lethal only at very high doses). It is a protein, MW 4854 (calculated from amino acid sequence), with 42 amino acid residues, with a high proportion of basic residues, 8 cysteine residues with 4 disulphide bridges and has a pI &gt9 and an LD50 (SC newborn mice) of 0.16 mg/kg. Robustoxin alone causes a typical syndrome of envenomation in primates and man of whole male Atrax robustus venom. (Sheumack et al 1983, 1984, 1985) Versutoxin (from male and female Hadronyche versuta venom.) Structurally very close to robustoxin, a protein neurotoxin, MW 4852, 42 residues, highly basic, pI &gt9, 4 disulphide bridges. 8 residues different to robustoxin, and considered conservative changes. LD50 (SC newborn mice) 0.22 mg/kg. Versutoxin alone causes almost typical syndrome of envenomation in primates and man of whole male Atrax robustus venom, the difference being the sustained hypotension typical of robustoxin, which is not seen with either versutoxin or whole Hadronyche versuta venom. Strong antigenic cross-reaction between robustoxin and versutoxin. (Sheumack et al, 1984) Venoms of important related species Hadronyche formidabilis - Venom reported as approximately equal in toxicity (both male and female) as male Atrax robustus venom, has caused similar cases of envenomation in man (no definite fatalities), and therefore probably contains a robustoxin-like component. (Sutherland 1983) Hadronyche infensa - Venom reported as approximately equal or greater in toxicity (females and males) as male Atrax robustus venom, and therefore may contain a robustoxin-like component. (Sutherland 1983) Other physico-chemical characteristics Several other components or properties of male Atrax robustus venom have been reported. These include: GABA; Spermine Complex; Lactic acid; Trimethylsilyl or pentafluoropropionate derivatives; Citric acid; Glycerol; Urea; Glucose; Glycine; Spermidine; Tyramine; Octopamine.Robustoxin (Atraxotoxin), Versutoxin Description While the venoms of most species of Hadronyche and the two unnamed Atrax have not been studied, those known to cause significant clinical effects in man, particularly Atrax robustus, have been examined in detail. Consensus of these studies is that lethal activity (for man) is contained in just one component of these multicomponent venoms. In Atrax robustus male venom toxicity is consistently several times (4 - 6) higher than female venom. Robustoxin (from male Atrax robustus venom) (Note: A component with similar or identical properties to robustoxin has been described by other authors, and named atraxotoxin (and possibly atraxin). As the most complete studies are for robustoxin, this name is adopted as the "type" even though, historically, atraxotoxin has precedent.) (Gregson & Spence 1981, Myelcharane et al 1983, 1984, 1985, Sutherland 1972a, 1972b, 1973b, 1983) Robustoxin is a unique presynaptic neurotoxin, lethal in man, other primates, and newborn mice, but non-lethal in many other laboratory animals (or lethal only at very high doses). It is a protein, MW 4854 (calculated from amino acid sequence), with 42 amino acid residues, with a high proportion of basic residues, 8 cysteine residues with 4 disulphide bridges and has a pI &gt9 and an LD50 (SC newborn mice) of 0.16 mg/kg. Robustoxin alone causes a typical syndrome of envenomation in primates and man of whole male Atrax robustus venom. (Sheumack et al 1983, 1984, 1985) Versutoxin (from male and female Hadronyche versuta venom.) Structurally very close to robustoxin, a protein neurotoxin, MW 4852, 42 residues, highly basic, pI &gt9, 4 disulphide bridges. 8 residues different to robustoxin, and considered conservative changes. LD50 (SC newborn mice) 0.22 mg/kg. Versutoxin alone causes almost typical syndrome of envenomation in primates and man of whole male Atrax robustus venom, the difference being the sustained hypotension typical of robustoxin, which is not seen with either versutoxin or whole Hadronyche versuta venom. Strong antigenic cross-reaction between robustoxin and versutoxin. (Sheumack et al, 1984) Venoms of important related species Hadronyche formidabilis - Venom reported as approximately equal in toxicity (both male and female) as male Atrax robustus venom, has caused similar cases of envenomation in man (no definite fatalities), and therefore probably contains a robustoxin-like component. (Sutherland 1983) Hadronyche infensa - Venom reported as approximately equal or greater in toxicity (females and males) as male Atrax robustus venom, and therefore may contain a robustoxin-like component. (Sutherland 1983) Other physico-chemical characteristics Several other components or properties of male Atrax robustus venom have been reported. These include: GABA; Spermine Complex; Lactic acid; Trimethylsilyl or pentafluoropropionate derivatives; Citric acid; Glycerol; Urea; Glucose; Glycine; Spermidine; Tyramine; Octopamine. Mode of action Studies on the mode of action of both whole venom and Robustoxin are hampered by low availability of venom and relative resistance to venom in many common laboratory animals, contrasting with the exquisite sensitivity to venom toxins in primates, including man (50 - 100 times more sensitive in some preparations). (Sutherland 1983) The clinical effects of funnel-web spider envenomation in man (and monkeys) appear directly attributable to one venom component, Robustoxin. This appears to act as a presynaptic neurotoxin. On the autonomic system the venom causes both inhibition of neurally mediated release of transmitters (eg noradrenaline, acetylcholine) and an increase in spontaneous transmitter release. A similar action on the skeletal muscle neuromuscular junction has been postulated. (Sutherland 1983; Sutherland & Duncan 1980, Sutherland et al 1980, Tibballs et al 1987) Given the current paucity of relevant in vitro studies of the mode of action of the venom, the detailed in vivo studies in primates (Macaca fascicularis) are most relevant. In summary, the effects recorded after experimental envenomation (IV or SC) with whole venom from male Atrax robustus were: Cardiovascular - initial fall in blood pressure (BP), then rise to hypertensive level, lasting several hours, followed by return to normal or progressive hypotension (lethal). Tachycardia, ventricular ectopic beats, bigeminy and transient second degree atrio-ventricular blocks were seen, though not in all monkeys. Pulmonary oedema - seen in 3 of 9 monkeys. Acid-base disturbances - all developed acute metabolic acidosis about 1 hour post envenomation, resolving spontaneously by 4 hours. Most developed a respiratory acidosis. Intracranial hypertension - seen in all monkeys. Temperature - all developed hyperthermia. Catecholamine excretion - marked increase in urinary catecholamines, peaking at about 2 hours after envenomation. Fluid shifts - all showed haemoconcentration. Creatine kinase - all showed massive rises in CK. Pharmacological denervation - both pre and post-envenomation administration of atropine + phenoxybenzamine + propranolol abolished the major features of envenomation and allowed survival of "massive" doses of venom. All known cases of human envenomation are due to bites. (Sutherland 1983) General: In the majority of cases of funnel-web spider bite, systemic envenomation does not occur, and any symptoms are confined to the local effects of the bite. The outcome cannot be predicted at the outset however, and all bites should be assumed to be potentially lethal. Local: One or two large fangs enter the victim with some force. The bite is very painful for about 30 minutes or more, with local erythema, and occasionally local piloerection, sweating, and muscle fasciculation. Local necrosis does not occur. Systemic: Onset of systemic envenomation may occur from 10 minutes up to an hour or more after the bite (with further delay if appropriate first aid used). Earliest systemic symptoms are usually tingling around the mouth which often occurs within 15 mins of the bite, tongue spasms, followed by nausea and vomiting, abdominal pain, profuse sweating, brisk salivation, lachrymation, and severe dyspnoea. The level of consciousness may rapidly deteriorate, with confusion or coma. Hypertension is usually noted at this time. Severe pulmonary oedema may develop quite early, and is a potential cause of fatality, particularly in children. The pulmonary oedema is mixed in origin, similar to neurogenic pulmonary oedema, with catecholamine release, high filling pressures, and membrane leak. While classic neurotoxic paralysis does not occur, local and generalised muscle fasciculation is commonly seen, including spasms of muscle groups such as jaw musculature. In severe cases coma has been reported, and some authors believe it may be due to raised intracranial pressure (not relieved by adequate control of oxygenation or BP), although this has not been proven in man. However clinical experience suggests coma is not common, and is probably a dubious sign of envenomation, most envenomed patients being anxious and alert until anaesthetized. On current experience, patients treated with antivenom do not develop coma. After several hours the above symptomatology may subside, with decreased secretions, although generalised muscle activity and coma may continue. There may be a gradual resolution or an insidious and intractable hypotension may develop, sometimes preceded by a brief period of semi- normality. The hypotension may end in death due to irreversible cardiac arrest, a possible mode of death in fatal cases in adults, sometimes many hours after the bite. The venom does not cause primary coagulopathy or renal failure, though these may occur as complications. Funnel-web spider envenomation is a complex multisystem disease. The findings in monkeys are relevant to human envenomation and should be consulted in conjunction with this section. Gray MR Aspects of the systematics of the Australian funnel-web spiders (Araneae:Hexathelidae:Atracinae) based upon morphological and electrophoretic data. In: eds. Austin A.D., Heather N.W. eds; Australian Arachnology; Miscl. Publ. No.5, Aust. Entomol. Soc. ; 113-125.